I think those dainty little paper-thin pancakes known as crepes (craps, crehpes, or craypes, depending on where you're located at the time) can be kind of intimidating to make, but I definitely feel very sophisticated when I order them at a restaurant. If you have a good recipe and technique and the right kind of pan, they're actually not intimidating at all. For this batch, I was undeniably inspired by Mel's enchilada crepes--until I saw them, I never thought about stuffing a crepe with savory goo. I opted to use a mixture of scrambled eggs, diced avocados, beans, and cheese, but the beauty of this kind of meal is that you can add whatever you like, whether it's strawberries and cream (yes, please) or tuna salad (no sir). Master crepe-making and you'll be cosmopolitan and unstoppable! To make the crepes, combine the flour, eggs, milk, water, sugar, salt, and butter in a blender and process until the batter is smooth and slightly foamy, about 10-15 seconds. Strain through a fine mesh sieve into another bowl and refrigerate for a minimum of 30 minutes, or preferably overnight. Gently whisk the batter to recombine before using. Lightly coat a medium (8- to 10-inch) nonstick skillet or crepe pan with unsalted butter and set over medium-high heat. When the pan is hot, pour 1/4 cup of batter into the skillet. Swirl the pan to evenly coat the bottom and sides, continuing to rotate until the batter is no longer running. Set the pan back on the stovetop and cook until the bottom of the crepe is light golden brown, about one minute. Using a silicone spatula, flip the crepe and continue to cook until done, about 15-30 seconds more. Continue with the remaining batter, brushing the pan with additional butter if necessary. Stuff with your filling of choice and eat on! Congratulations on the cupcakes! Editor's Choice is very impressive. 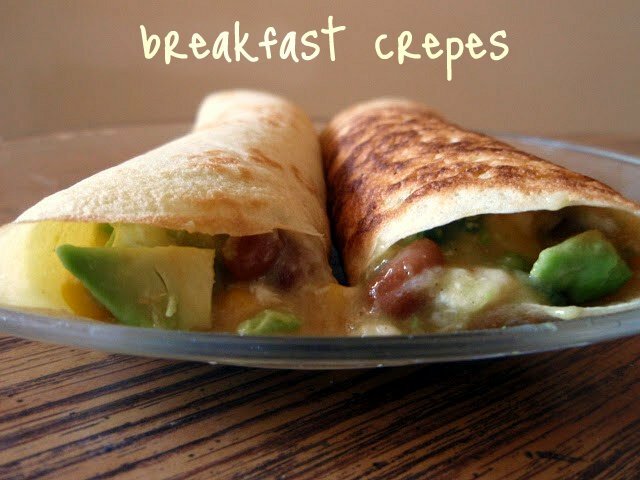 These crepes sound really delicious too! Crepes have always intimidated me (making them, not eating them). I do like the thought of savory crepes, and maybe I should give them a try! Brings back memories of working at The Magic Pan while in high school. Delish! I could eat that for the dinner. I love savory fillings for crepes, Grace!In Colombia we have a popualr restaurant called Crepes & Waffles and They make delicious fillings...my favorite is Crepe with chicken curry...It is fantastic!Yours sounds delicious. Isn't the best when you master something that seems so sophisticated? Love making crepes and love the sound of your filling! I've never had savory crepes... they look super tasty. I'm wishing I had these right now...minus the avocado! I will try them for sure...thanks for sharing your delicious recipes. I would kill to learn how to make a good thin delicate crepe like this. I'm going to try these, does a regular nonstick pan work? @Sue: yep--that's what i use! omigosh that looks spectacularly delicious! I am going to get a crepe pan immediately... or go out and order a plate right away! I couldn't agree more, crepes are very versatile and only one's imagination is the limit! They look scrumptious! Those are lovely, thin crepes! I keep thinking one day I'll practice making crepes, now I'm inspired again. This savory filling sounds great for them. I have not made crepes in such a long time! Thanks for the yummy reminder. Beautiful job, Grace. They look delicious. I've only made sweet crepes...and yours look so delicate....I really have to try your savory version. What a way to start the day! I love crepes! These look absolutely delightful Grace. Oh yum! I have had savory crepes before but never thought to make them at home! How delicious! I am so hungry right now looking at those! Savory crepes are definitely in my top three breakfast items. I haven't ever tried making them though because their thinness intimidated me haha, I could just imagine tearing them instead of flipping them. Your instructions have given me hope though! I will have to try making crepes soon :) Sounds delicious! Do they fall apart when you roll them? @Blond Duck: no! they're actually very elastic! I actually prefer savory crepes to sweet. They're common in France. I should follow your lead and make them at home! I have not made crepes in so long! Yours look absolutely scrumptious. Crepes...Yummy!!! I love making crepes with strawberries in them and this recipe looks like it would make a great breakfast. I have to do these! And congrats on the cupcakes! Mmm, these look delish. I always order savory crepes when we go to the crepe place near my house, but I had no idea they were so easy to make! Great post. I loooooove crepes. With just butter and sugar. Yum.